Brass Cuff Bracelets have always been a trendy fashion accessory. We are a reputed Brass Cuff Bracelets Manufacturer, Supplier and Exporter. 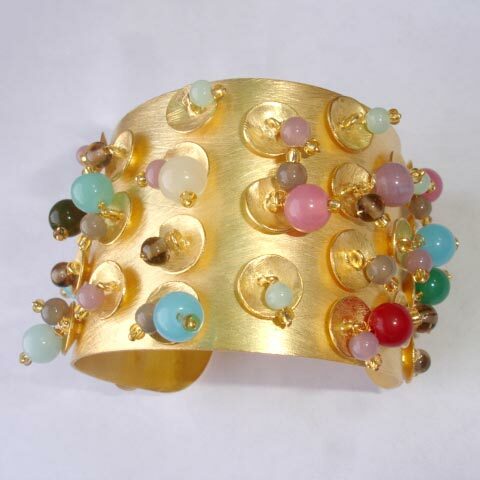 We offer elegant Brass Cuff Bracelet which is stylish and exquisitely designed. The Brass Cuff Bracelet that we offer is made from high quality brass plate which retains its lustre for a long time. The gap between the two sides of the Brass Cuff Bracelet enables it to fit with the wrist of any size. The Brass Cuff Bracelet is skin friendly as well. We provide these beautiful bracelets at discounted price, compared to other Brass Cuff Bracelet Suppliers. Also, the large number of overseas clients we serve has made us a leading Ladies Brass Cuff Bracelet Exporters in Jaipur.